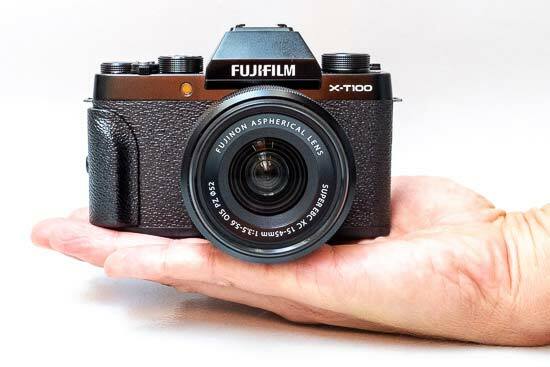 The Fujifilm X-T100 is a mid-range compact system camera with a 24 megapixel sensor, 4K video recording, three-way tilting touchscreen, electronic viewfinder and Bluetooth connectivity. 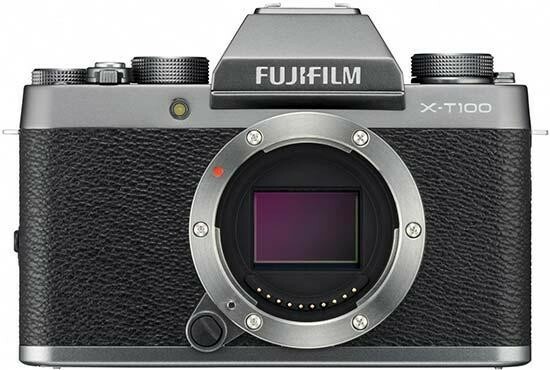 It sits above the entry-level X-A5 and below the prosumer X-T20 in the now extensive Fujifilm camera range. The X-T100 features a slightly revised version of the APS-C Bayer image sensor found in the cheaper X-A5. Importantly it’s not the same as the X-Trans sensor that's used in Fujifilm’s higher-end X-Series cameras (beginning with the X-T20), which offers better image quality. The X-T100 also employs the same hybrid AF system as the X-A5, meaning you have both contrast and phase detection AF points in play, although it’s a 91-point-array that is simpler than those found in the more expensive X-Series cameras. Other key differences between the X-T100 and the entry-level X-A5 are the former's electronic viewfinder and three-way tilting LCD screen. The X-A5 lacks a viewfinder, instead relying on the rear LCD for image compostion, while the X-T100 offers the ability to twist the LCD out to the side and to the front for easier selfies, as well as up and down. The Fujifilm X-T100 is available in Black, Dark Silver and Champagne Gold colours and costs £619 / $699 in a kit with the XC 15-45mm zoom lens. It's also available body only in the US for $599 (but not in the UK). The new Fujifilm X-T100 essentially offers most of the key features of the cheaper X-A5 camera combined with the more premium look and feel of the higher-end X-T20, and subsequently it sits halfway between those models in terms of the official price. 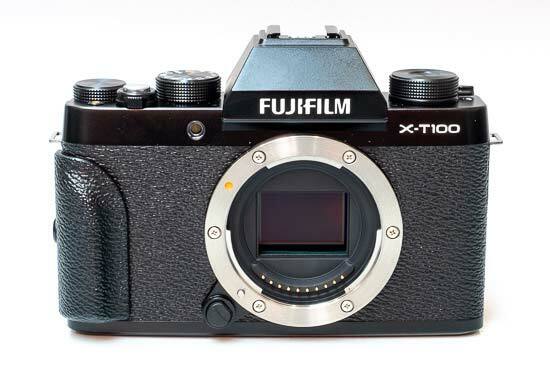 The X-T100 weighs 448g, which is actually slightly heavier than the X-T20 by 65g, despite having an aluminium and polycarbonate plastic body rather than a more premium magnesium alloy one. This extra weight does give what is rather a small camera a surprisingly nice "heft" in the hand. We did miss the much bigger handgrip on the X-T20, though, with Fujifilm instead including a small detachable handgrip in the box which can be optionally added to the otherwise flat front-plate. 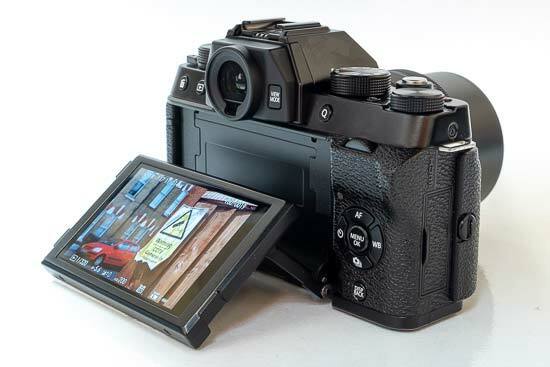 While this is a nice idea in theory, we'd rather see the X-T100 have a proper handgrip integrated into its design, along with a rubberised thumb-grip at the rear in place of the rather hard plastic surface. 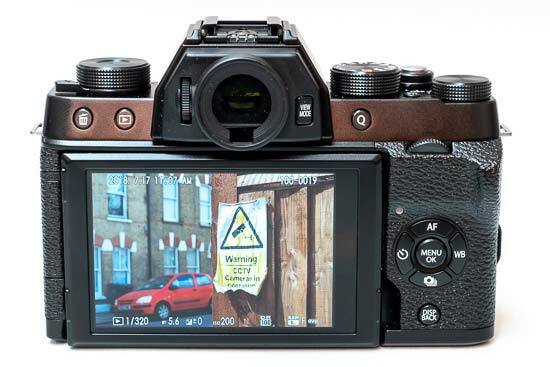 The X-T100 employs a very similar APS-C Bayer sensor to the X-A5, with 24.3 megapixels on offer rather than 24.2. The more expensive X-T20 is the first model in the current Fujifilm range to feature an X-Trans sensor, which Fujifilm claims will offer better image quality, so that's an important difference to the cheaper X-T100 if you're considering both models. The large APS-C sensor makes it easy to throw the background out of focus and achieve some really nice bokeh effects, and the extensive ISO range of 100-51200 (note that ISO 100, 25600 and 51200 are JPEG only) makes the X-T100 very well suited to low-light shooting, allowing you to hand-hold the camera in places where you'd usually be reaching for a tripod (if allowed) or other support. The clever ISO Auto Control setting allows you to set a maximum sensitivity (up to 6400) and a minimum shutter speed (1/30th is a good starting point), with the camera over-riding your ISO choice if it thinks you're being too ambitious whilst maintaining a shutter speed that won't introduce camera shake. This new model also shares the same phase-detection auto-focus system as the X-A5. This employs a total of 91 AF points arranged in a 13x7 rectangular grid with a central block of 35 phase-detection points, which again isn't as advanced as the AF system found on the X-T20, and is therefore another key differentiator between the two models. A key difference between the the X-T100 and the cheaper X-A5 is the former's electronic viewfinder, which offers the same 2.36m dot resolution as the flagship X-T2 along with a magnification of 0.62x. The X-A5 doesn't have a viewfinder at all, instead relying on the rear screen for composing images, so if this is a must-have feature for you, then the new X-T100 is currently the cheapest Fujifilm camera to offer it. The X-T100 has a unique three-way LCD screen that both tilts up and down and rotates out to the side to face forwards for those all-important selfies. It's a clever design that we haven't seen before on a Fujifilm camera. The Fujifilm X-T100’s 3-inch 1040K-dot LCD screen is also touch-sensitive, which means you can use it to set the AF point too, or even fire the shutter release. On the left hand side of the screen you’ll see a small icon which if you press allows you to choose between using the screen to set AF point, or to have it focus and then take a picture. If you prefer, you can turn off this functionality altogether, but it’s much quicker than using the buttons to set the point. With the XC 15-45mm f/3.5-5.6 kit lens attached (the smallest X-Series zoom lens available) or a compact prime lens like the XF 35mm f/2 R WR, you have a camera that sits perfectly in the hand. We did find the XC 15-45mm power-zoom lens to be a little cumbersome in its operation, though - check out our Fujifilm XC 15-45mm f/3.5-5.6 review for the full low-down. The X-T100 actually has two kinds of shutter, mechanical and electronic. When using only its mechanical focal-plane shutter, the X-T100 has a very adaptable top shutter-speed limit of 1/4000th second in all shooting modes and a flash-sync speed of 1/180th second. The completely silent electronic shutter provides a much faster top shutter speed of 1/32,000th second. This allows you to continue shooting wide-open with fast aperture lenses in the brightest of conditions without having to resort to fitting a glass ND filter or using external flash and lights. There are some important caveats with the electronic shutter - the ISO range is restricted to 200-6400, you can't use the flash at all, and the slowest shutter speed is only 1 second, but overall it's a great addition that makes the X-T100 more versatile. In terms of operational speed, the Fujifilm X-T100 is satisfying enough to use. Shutter lag is fine, so once you have set the focus, you'll rarely miss the moment because the camera can't fire the shutter quickly enough, and it starts-up in less than half a second (0.4sec to be precise) when High Performance mode is set to ON. Continuous shooting speeds are respectable enough rather than outstanding, with 6fps available for up to 26 JPEGs, or 3fps for an unlimited number of JPEGs. The X-T100 features enhanced built-in wi-fi connectivity. Install the FUJIFILM Camera Remote App and you can transfer your pictures immediately to a smartphone or tablet PC and then edit and share them as you wish, transfer stills and video onto the camera, and embed GPS information in your shots from your smartphone. You can also control the camera remotely, with the list of available functions including Touch AF, shutter release for stills and movies, shutter speed, aperture, exposure compensation, ISO sensitivity, Film Simulation modes, White Balance, macro, timer and flash. The built-in wi-fi also provides a simple means to backup your photos to your home PC. Additionally, the X-T100 can be connected to your smartphone via Bluetooth. This has the advantage that the camera and smartphone will automatically connect with each other (if Bluetooth is enabled on both) when the Camera Remote app is opened, a process that only takes about 5 seconds. If you enable "Auto Image Transfer On", the latest batch of images will be automatically transferred to your smartphone. The Fujifilm X-T100 can record 4K video, but unfortunately only at a paltry 15fps, which results in very "stuttery" video that's frankly pretty unusable. Thankfully, the X-T100 can also record Full HD 1080p movies at 60p / 50p / 30p / 25p / 24p for up to 15 minutes with stereo sound. There is a HDMI port for connecting the X-T100 to a high-definition TV, and you can adjust the level of the internal microphone and attach an external mic for better sound quality via the 2.5mm Mic and Remote ports. On the top-left of the X-T100 is a large, unmarked Function dial which automatically changes a specific option for the currently selected shooting mode. So in the manual shooting modes (PASM), it changes the Film Simulation type, whilst in the SR+ auto mode, it sets the Self-timer options. It kind of makes sense when you start using it, althoguh you can customise the dial anyway if you'd prefer to have more control over what it does. Underneath is a switch for releasing the built-in pop-up flash, with a dedicated flash hotshoe positioned on top of the electronic viewfinder in the centre of the top-plate. Over on the right is a shooting mode dial, the shutter release button, encircled by the on-off switch, a customisable Function button which by default changes the ISO speed, the one-touch movie record button, and the first of two control dials which are used to set the aperture/shutter speed/exposure compensation. The second control dial is located underneath your right thumb on the rear of the camera. 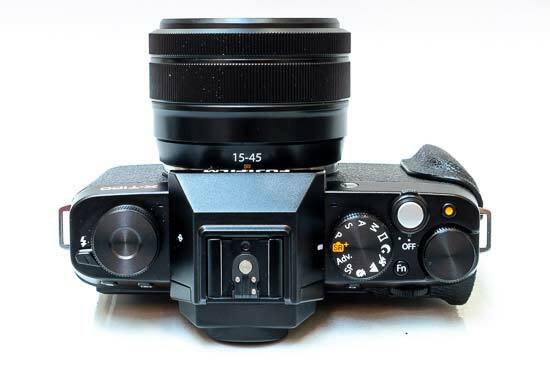 The control dial on the top is rather awkwardly located when using the fully Manul shooting mode - we'd prefer to see it positioned on the front of the top-plate, rather than the rear, but kudos to Fujifilm for including it at all. The X-T100 has a logical enough rear control layout. Above the LCD screen and to the left of the viewfinder are two buttons for choosing image deletion or playback, while on the right is the Quick menu button and the rear control dial. The Q button provides quick access to lots of frequently used shooting settings including the ISO speed, White Balance, File Size and File Quality, with the 4-way controller and command dial used to quickly change them. In the middle of the controller is the Menu button, which accesses the eight Shooting and Set-up menus. The 4-way controller buttons allow you to change the AF point, White Balance, Burst and Bracketing, and Self-timer options. Underneath is the Disp/Back button which is used for changing the LCD display or going back to the previous menu option. The X-T100 uses a NP-W126S Li-ion battery, which provides a repectable CIPA-measued battery life of 430 shots. The memory card is inserted in the same compartment as the battery on the bottom of the camera, alongside which is a metal tripod mount.